Before I start saying important things about journalism - I want to thank some people. First, thanks to my wonderful husband Drew and my kids Nikita, Elijah and Forrest who are excited to make the club their second home this year. And my sisters - they're the group that's laughing too loud over there - they came from all over the country to be with me tonight. As a group we're a little nutty, but I love you all. Thanks to Al, and Nancy and Steve for being great colleagues, mentors and inspirations. You were all generous to be here and to say nice things. And of course thanks to my dear friend Patrick, who is always generous, helpful and tells a great story. Thanks to Bill McCarren and the Press Club staff who actually do all the work that makes this place function properly. And I'd like to acknowledge the Press Club Board and to all the former presidents who have been reaching out with your wise words of wisdom. God knows I need them. And to all my colleagues from NPR - and I'll call out my editors Joe Neel and Gisele Grayson - for teaching me how to do radio. I was so excited when Joe offered me the job that I sent him flowers. And finally I want to thank Justice Breyer and Joanna for making the time to be here tonight. I first met the Breyers when I was about 14 or 15 years old and went to high school at Milton Academy with their daughter, Chloe. I'd go to their house sometimes for sleep-overs. Or we'd stop in on days when we went to buy posters or records in Harvard Square. Fast forward a few years and I'm in Journalism school in Chicago - I'm about 23 - and I'm writing a story about motorcycle helmet laws. And the libertarian in me was sure that the government should not be able to force people to wear helmets. And I think - very cleverly - that I know a federal judge. So I call Stephen's office - which at that time was in Boston. And he gets on the phone, and the first thing he says is, "Ali, you know that anything I say has to be off the record." And I pause... and then casually say, "of course." But my head is spinning and all I can think is, "holy Moses, this guy actually thinks I'm a grown up." So tonight I won't be telling you what he said about the helmet laws. But I will say that that was the moment when I had my first inkling that being a journalist actually meant I had power. Having a pen or a microphone and an outlet that will air or publish your work is like having a gun and a badge. It's a huge responsibility. Those tools can can be used to make our society a better and richer place. Or they can be abused. We need to wield those tools fearlessly but also with great care. Our job is to find the truth and hold the powerful to account. I don't think it's a secret that journalism is going through a rough patch right now. A lot of people don't like us. And more and more people don't seem to trust us. Our neighbor down the road attacks our credibility and our character and calls us the enemy of the people. But we - those of us here in this room - know better. We journalists are not the enemy of the people. We are the advocates for the people. A free and vibrant press is the basis of a successful democracy. We can't have representative democracy - government by the people - if the people don't know what their government is doing. So we do the hard work. Sometimes it's boring work. We read the budgets, and dig through the regulations. We ask the hard, intrusive questions and we doubt the answers. We check the facts. And we work to keep our government and other powerful institutions... and people... honest. And this work can make people angry. Last year, 53 journalists around the world were killed just for doing their jobs. Four of them died just up the road in Annapolis when a gunman, angry about a story, invaded their newsroom and shot everyone he could see. So who advocates for the journalists? Well, we do. 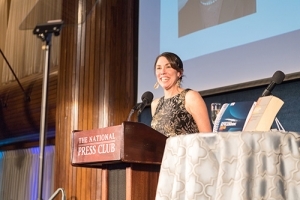 Over the last several years the National Press Club has become a leading voice in defending the freedom of the press, here in the U.S. and across the world. When we speak, we speak loudly - with the unified voice of our more than 3,000 members. In 2015 and 2016 we worked closely with the Washington Post to fight for the release of reporter Jason Rezaian from prison in Iran. Jason is back home now, and he and his wife Yegi are active members of our Club. And there's Emilio Gutierrez, a journalist who fled Mexico when he faced death threats for his reporting. He sought amnesty here in the U.S. A little over a year ago Emilio stood here and accepted our John Aubuchon Press Freedom award on behalf of his fellow journalists in Mexico. And then, a few weeks later, U.S. immigration agents picked him up and threatened to deport him. We're working closely with Emilio's attorney to ensure he can stay safely here in the U.S.
And this year we're embarking on a new cause: to locate and secure the freedom of freelance photographer Austin Tice. Austin, who's a fellow Hoya, worked for the Post and McClatchy. He disappeared in Syria six years ago. We at the Press Club are working with those news organizations and with the State Department to raise awareness about Austin's case in hopes of gaining new information about his whereabouts. That's what we're already doing in the realm of press freedom. As president I want to expand that work into the realm of freedom of information. Any journalist who covers government knows that - for years now - it's been getting harder and harder to find out what our public servants are doing. When I was at Bloomberg I was part of a team that successfully sued the Federal Reserve to get details about the bank bailouts in 2008. And at NPR we're turning more and more to the courts to ensure that the Press and public have access to government information. So this year I'm planning to expand our Press Freedom team so that we can speak out forcefully on freedom of information issues. While we continue to look to the future with plans for great speakers, more professional development and a bolder, growing voice for press freedom, we also strive to honor our past and the maintain the Club as its founders intended: as a convivial place for the profession to gather. and to foster the ethical standards of the profession. 112 years later we still pretty much do all those things. Finally, I want to thank the National Press Club members for electing me to be their president for the year. I just love this place, its history and all it stands for. It's an absolute privilege to be able to serve you as President and represent all we have become.